This article explains how to add a virtual hard disk of one virtual machine to another virtual machine as a second hard drive. Start Parallels Desktop but do not start your virtual machines. Go to the Configuration of the virtual machine which you want to attach the other virtual machine's hard disk to. Click on Location and navigate to another virtual machine's hard disk file (.hdd), then click Open. 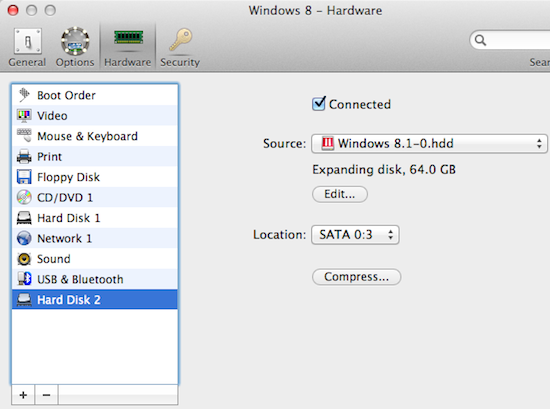 Now the Hard Disk 2 is shown in your first virtual machine's Configuration. You have two virtual machines: Windows 8 and Windows 8.1 and you need to attach the virtual hard disk of Windows 8.1 to Windows 8 virtual machine. 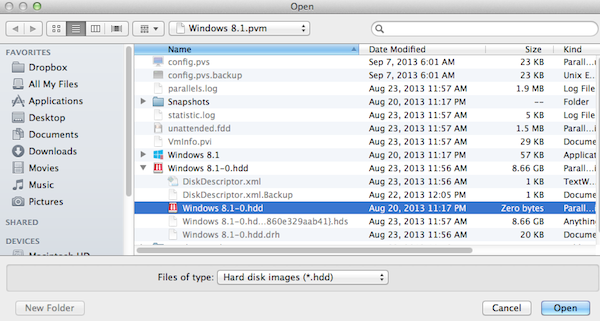 Both virtual machines are located in the /Users/username/Documents/Parallels folder and you can see them as Windows 8.pvm and Windows 8.1.pvm. Then you select Type: Existing image file. Under Location you go to Documents > the Parallels folder, click on Windows 8.1.pvm, go to Windows 8.1-0.hdd > Windows 8.1-0.hdd. Note: the first .hdd item here is the folder that contains the virtual hard disk .hdd file. Now your Windows 8.1-0.hdd is attached to your Windows 8 virtual machine as a second drive.